Jeff Lockwood ran cross-country and track at Danbury High School in Danbury, CT. Upon graduating in 1966; he attended the University of Arizona. After graduating from the U of A, he began his teaching and coaching career at Sahuaro High School. 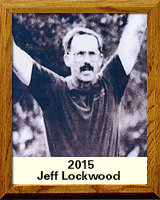 Lockwood logged time as both the assistant track coach and head cross-country coach at Sahuaro from ’73 to ’96. Cross-country is where he made his mark. He coached the boy’s team to the 5A state championship in 1984, and was runner-up in ’79 and ’83. From 1989 to 1993, the Sahuaro boys won 58 consecutive dual meets. His ’84 team finished the season ranked 21st in the nation. The Sahuaro boys’ team won seven division championships between 1983 and 1994. Lockwood was one of the early advocates for the establishment of girls’ cross-country in Southern Arizona. Beginning in 1977 with just 3 girls, Sahuaro girls soon achieved amazing success, finishing 3rd in the first state race they entered (’78). The girls went on to win four state championships (’80, ’88, ’89 and ’90) and 3 runner-up trophies (’79, ’81, ’91) in a 14-year span. Winners of 7 divisional championships, Sahuaro girls won 52 consecutive dual meets from 1987 to 1991. His 1989 team finished the season ranked 11th in the nation. Lockwood was named Southern Arizona Coach of the Year several times, and was selected Arizona state cross-country Coach of the Year for boys in ’84 and for girls in ’88. He won the Arizona Republic newspaper’s Women’s Sports Award in 1981, and was named Southern Arizona’s All-Time Cross-Country Coach by the Tucson Daily Citizen in May 2009.